Addicted to Rubber Stamping: It's a Pig Thing! HUGE HUGE HUGE release this month over at Doodle Pantry. You will not believe the awesome digital stamp sets, svg cut files and digital papers being released today. So much fun!! 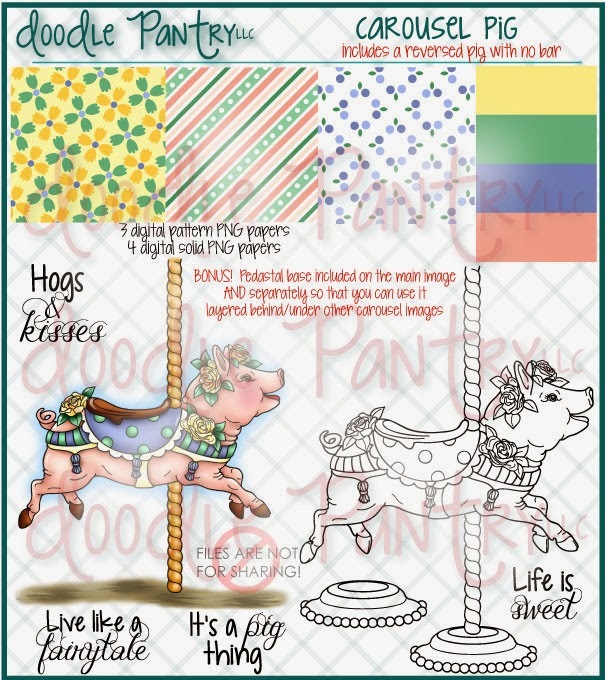 Do you remember last month when I told you Laurie was doing more carousel items, possibly even a pig? Well, here is the set Pig Carousel. I decided to use the pig without the pole and stand for my card. Normally, it faces to the left, so I just did a horizontal flip using my computer software. I printed the pig on white card stock and colored it using Copic markers (pig body and saddle - RV000, RV02, RV04, RV17; roses - Y00, Y11, Y13; leaves - G03) and then fussy cut the image. The paper roses were colored with Copic marker Y00. I used the Sakura Clear Star Gelly Roll pen on the roses and the trim of the saddle. For the dots on the saddle, I used colored crystal bling. The pig was placed on white card stock with a double stack of pop dots in the center of the body and then glued down on the feet, tail and snout. I then placed the flowers in a semi-circle and then placed the image and flowers under a plastic dome. I printed the digital paper from the Bright Smiles Digi Paper Pack and then used my Silhouette Cameo to cut the oval to fit over the dome. I then placed it on black card stock and then a white card stock base. The sentiment is from the Pig Carousel set and printed on white card stock and punched with a SU oval punch and placed on a black mat punched with a larger SU oval punch. I added 3 more flowers and more yellow bling to finish it off. Here is picture of the set. Now, for even better news...this set can be yours for FREE. This is the featured set for Doodle Pantry Digital Challenge #44 beginning today at 12:00 p.m. EST. on the Doodle Pantry Blog. To receive this digital stamp set for free, all you need to do is enter the challenge using a Doodle Pantry image. SALE - from today until March 8, you can get 30% off all new March releases. Just use coupon code newmarch30 when you check out. Don't forget to look for the "free w/purchase" items before checking out! I hope you will stop by the store and see all the wonderful items being released this month. You will NOT be disappointed. Beautiful design, Susan! Gorgeous card. I love your pig Susan, your colouring is gorgeous! What a perfect idea to put it under a plastic dome. Gorgeous card Susan and the dome over the image is awesome. Well done, love it! What a cute pig! Thanks for linking up with us this week at the Sister Act Challenge Blog. Fabulous card, so creative and I love the adorable pig. Fun card! I love how you altered and colored the image. So glad you joined us at Savvy Handmade Cards. Fun image--thanks for sharing with us at IBS. Love it! The coloring is awesome. The paper is perfect and love the dome...what is it? Lovely fun card! Thank you for joining us at Digitally Sweet. This is a wonderful creation! Darling! Thank you for sharing your work with us at Word Art Wednesday! We are blessed by your support and participation! A great card and loving the cute pig thanks for joining our challenge this fortnight at crafty girls. Cute card. Thank you for joining the challenge at Craftitude. Hope to see you again next time. Great job with this image Susan, and the perfect choice of dp! Love the dome overtop - really sets the image off! This is really cute!! I love all the flowers! This will be a great keepsake because it's all under that dome! Neat!